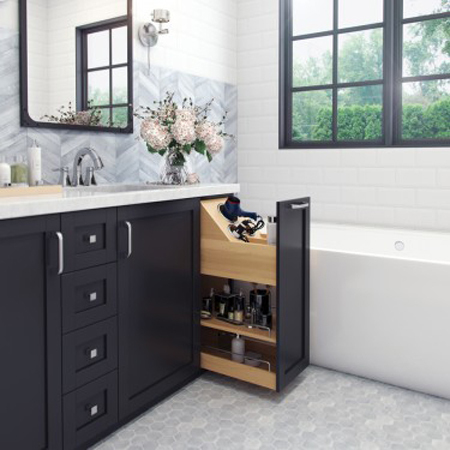 Hardware Resources’ new “no wiggle” eight inch vanity cabinet pullout features premium soft-close, concealed slides on the bottom and patented top mounting bracket with heavy duty slide on top to eliminate side-to-side movement and sag. The 19-inch-deep, three-shelf pullout adds nearly 450 square inches of storage space for grooming gear and features an integrated heat shield that protects the unit's UV-coated white birch construction. An optional divided acrylic top tray features one large and three small compartments for organizing makeup, jewelry, and other miscellaneous items. Also available is a nine-inch-deep grooming organizer insert that can be dropped into the pullout’s top shelf and includes divided storage for hair accessories, three stainless-steel canisters to hold hair-styling appliances, and dividers for appliance cords. 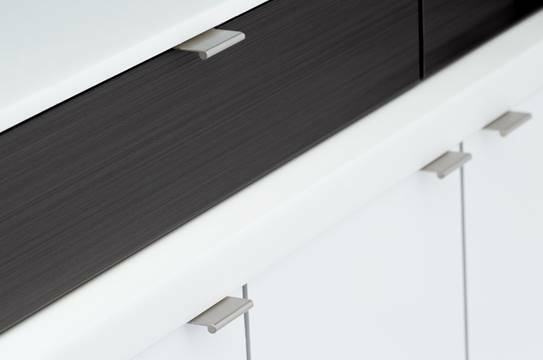 The unit ships fully assembled and features patented six-way adjustable door mounting brackets.